- When using a laptop as a desktop replacement the battery should not be left in for long periods of time. The laptop will over time discharge the battery. Remove the battery,making sure that it is charged to 50% and store it in a dry, warm place. Ensure that it is wrapped protectively and nothing will be dropped on it. - The battery should be re-installed every 3-4 weeks and allowed to fully discharge. Leaving a battery in storage for longer than this without using could cause the battery to fully discharge as the circuitry of the battery itself consumes power. 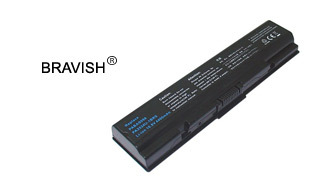 - Leaving a battery in a laptop while using an electrical outlet for long periods of time will keep the battery in a constant state of charging up and that will reduce the life cycle of the Toshiba A200 battery.